The stage magician Malachi Muldoon is the world’s most dangerous practitioner of the arcane arts with his performance of the notorious bullet catch. And his show in Bear Creek draws the interest of Adam Clements, and Deputy Hayward Knight, although for very different reasons. While Clements is keen to join Malachi on stage and become part of his act, Haywood is out to try and solve an old mystery: it seems that wherever Malachi Muldoon performs, a trail of bodies is left behind. Before long, Adam and Haywood are embroiled in Malachi’s web of deception. Can they unmask the guilty when they are forced into a showdown with a man who hides the truth in plain sight? Misdirection is often used by magicians to fool their audiences and here Ian Parnham proves that writers have perfected that art too. 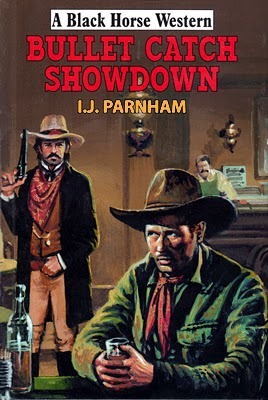 Parnham manages to easily lead the reader into believing they know who the killer is yet manages to conceal the motive until he is ready to expose the truth. Even then there are more surprises waiting. Filled with terrific characters this twisting tale cannot fail to grab the readers’ imagination. As well as the dramatic and tense bullet catch performances there are more deadly exchanges of gunfire. Then there’s the mystery of why one man is trying to bring an end to Muldoon’s show and why does he keep telling Clements that if he becomes part of the act he will die? Ian Parnham has once again written a gripping book that is extremely hard to put down. With many unforeseen twists and turns I’m sure most readers will enjoy Bullet Catch Showdown immensely. Nothing in Sheriff Frank Gaylord’s background had ever prepared him for this. Pushing forty years of age, but still strong and fast with a gun, Gaylord truly believed he’d done a good job in Colter County. But there was talk behind his back. Talk about how he was secretly on the payroll of the Chain Ranch. Talk about how he favoured the large cattle barons over the small ranchers. And now, as his re-election approached, more than Gaylord’s job was on the line. His honour and the lives of his best friends were in jeopardy as well. 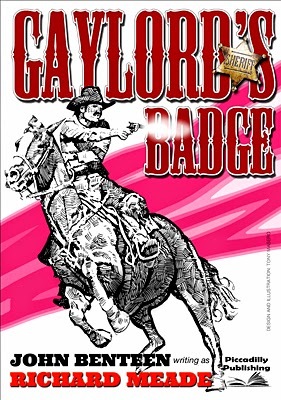 Sheriff Gaylord had always been an honest lawman, but when wealth, power and a beautiful woman are dangled in front of him, it looks like Gaylord’s badge is about to be bought. And suddenly, Frank Gaylord must meet his most dangerous enemy yet – himself. Sheriff Frank Gaylord makes for a very engaging lead character. Sure he’s flawed but he believes he is doing the right thing. Believes he is upholding the law as it should be. Yet slowly he begins to see how others might believe he has been bought, causing a lot of self-examination and this is the main thrust of this fascinating story. The election campaigns throw up many questions and it seems Gaylord is bound to win but he, and his backers, have forgotten one thing. Wyoming has given women the right to vote and they seem to be behind the opposition. John Benteen really builds the tension well and at no time is it obvious who will come out on top. Then the killings begin and everything is thrown into doubt and confusion runs rampant, particularly with who is playing who and to the true motive and identity of one of the characters. I found this book to be a gripping read. A story that tells a little of Wyoming’s history with the female vote and of the powers behind large cattle empires that blends perfectly into the fictional part of the tale. There’s also some surprise deaths, and plenty of gunplay. 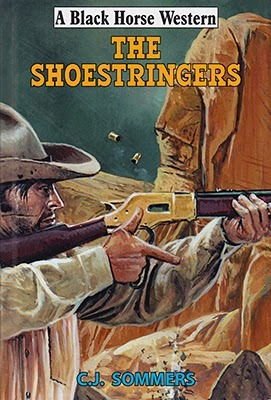 So, once again, John Benteen proves that he is a writer all western fans should read. 1861, the Flathead Lake country – where a tinderbox of hate ignited an inferno of violence. Fargo is guiding a squad of horse troopers to Flathead country to check on homesteaders, when he comes across a pack of vicious varmints up from Texas causing no end of terror for the settlers. And there’s only one man who can take on the troublemakers: the Trailsman. Taking on a bunch of killers is the least of Fargo’s problems in this extremely fast moving tale. The Trailsman has to deal with a love-struck young woman who has set her mind on marrying him! Something Fargo dreads. How he tackles this situation tests his patience and makes for some excellent reading that often had me grinning. 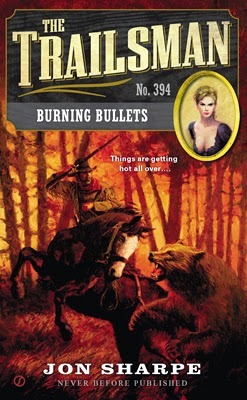 As well as terrific dialogue, the action scenes are breath-taking, especially those during the latter part of the book when a far greater danger than marriage or savage killers threatens all: fire. Jon Sharpe, in this case David Robbins writing behind the pseudonym, really does excel in his descriptions of the frantic attempts of man and animal to escape the all-consuming flames. The superb cover painting gives you some idea of the situations Fargo finds himself in. Does everyone escape the forest fire? Does Fargo manage to talk his way out of marriage without hurting anyone’s feelings? Grab yourself a copy of this book and I’m sure you’ll be as thoroughly entertained as I was finding out the answers. Benedict Trout, long-time foreman of the big K/K Ranch, has been cut loose for being old, and Eddie Guest, a new hire, has been fired for being too young. So with nowhere to go, Trout and Guest are riding west. When they reach the RU Crooked Ranch they discover a place in terrible shape: run by a widow and her young daughter, the women are broke and without expectations. Standing at a crossroads, the ranch is coveted by the boss of a nearby town, Cyrus Sullivan, who is keen to investigate reports of a gold mine on the land. The four unlikely allies are in this for the long haul, and must sit tight and fight long and hard to defend their shoestring operation against outlaws, thieves, and the greedy gold hunters. This tale deals with how rumours can get out-of-hand; whispers of gold becoming truth without proof. As the believers gather to take the mine away by force so the tension rises. Just how can two men and two women defend the ranch against such strong opposition? The story is told mainly through Trout, a man who just wants to ride on, but keeps finding an excuse to stay on the RU for just another couple of days no matter who much he says he wants to leave. This adds a gentle touch of humour to balance the coming threat of violence. C.J. Sommers is a pseudonym used by Paul Lederer, and he has created some very likeable characters that you hope will all survive, and if they do, will hopefully return in another book. The story builds well, at an ever increasing pace to where Trout decides to take the war to Sullivan single-handedly. Does Trout survive? Do his allies? Is there a gold mine on the RU? I can’t answer any of those questions here, but I’m sure you’ll be as entertained as I was finding out the answers. With help from Ezekiel “Zeke” Henry, a fellow inmate and former slave, Lucas manages to escape prison. Riding with Zeke to St. Louis, he soon discovers that his former partner is still alive, using a different name, and doing big business with the railroads – and he has Lucas’s lost love with him. On the run from the law and up against a rich and influential enemy, Lucas is about to take on the most dangerous fight of his life. Beginning his story with a desperate jailbreak Larry D. Sweazy throws a number of questions at his hero that will ensure you keep reading the book, such as who orchestrated the breakout and why? Sweazy has created a superb set of characters for this tale, not least the totally unhinged supposed dead man who will do anything to keep his true identity a secret. And Charlotte, Fume’s lost love, just what part does she have to play in the deadly situations Fume finds himself in? Switching regularly between his characters Sweazy often leaves them in cliff-hanger predicaments thus keeping the reader turning the pages. He also includes a number of plot twists that will have you wondering how Fume can possible triumph in the end, and even though all the major plotlines are resolved a few threads are left dangling for continuation in the next book of the series. If you’ve never read any of Larry D. Sweazy’s books then this is a terrific place to start. 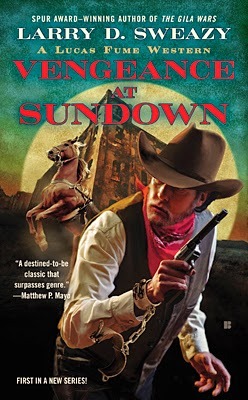 Vengeance at Sundown is a gritty, raw, fast moving, action-packed read that I’m sure, like me, will leave you eagerly anticipating the next Lucas Fume book.